Les Carroz has long been a popular ski resort, with its proximity to Flaine, and it's ease of access into the Grand Massif. Recent years have seen something of a renaissance in the village - with more facilities, improvements in the lifts, and a general tidying up of the village centre, where now you can find a choice of appealing bars and restaurants. There is also a good choice of accommodation, with small hotels, brand new apartments and a growing number of catered chalet. Located just a little over an hour from Geneva airport it is an easy and quick journey, and the TGV from Paris stops at nearby Cluses, a short 10-15 minute drive away. 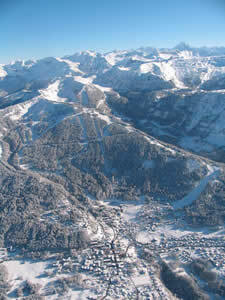 The Grand Massif ski area offers 265km of pistes, and comprises 5 different villages, inlcuding Flaine and Samoens. It is excellenty linked, so it is possible to cruise the blues of Les Carroz and Morillon, tackle the steeps of Samoens, and the off piste at Gers all in one great day. There truly is something for everyone! Summer time offers a wonderful choice of activities including mountain walks to suit all levels, mountain biking, tennis, golf (at Flaine, with fabulous views), horse riding, canyoning and much, much more. The town has a weekly typically Savoyard market on Tuesday morning, and has retained all its charm, despite recent development. It is also within an 1-2 hours drive of some of the area's most famous attractions, such as Mont Blanc and Chamonix, Megeve, Annecy, Lake Geneva and Evian. a good choice of restaurants, ranging from gourmet to budget. Well-known is Les Servages for a gourmet experience. mainly friendly bars, around the main square. walking with snow shoes, weekly market, and with a car places like Chamonix, Annecy and Geneva are all within an hour.